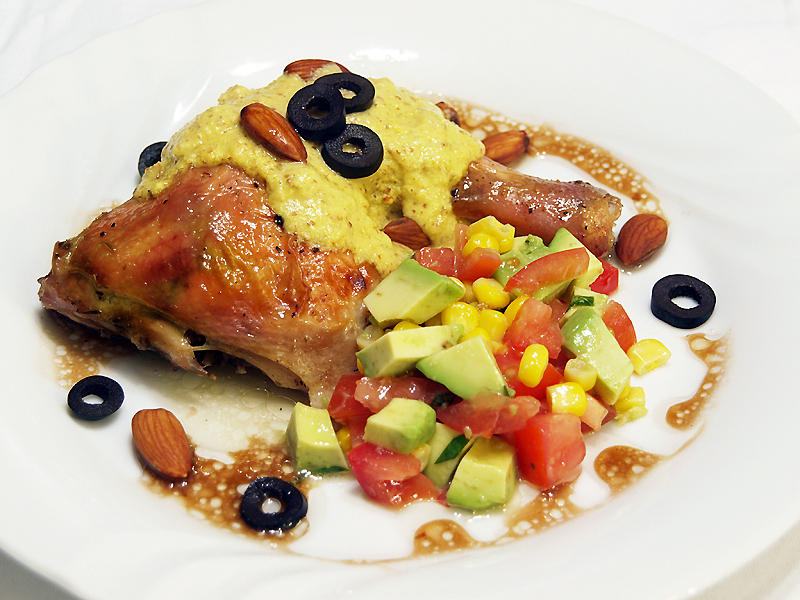 Pipian is a type of Mexican sauce made out of either roasted almonds or pumpkin seeds, traditionally served with chicken roast and enchiladas. A very old recipe which dates back to the Aztecs, the first account of this recipe was when it was mentioned by Fray Bernardino de Sahagún’s in “Historia General de las Cosas de Nueva España” during the late 1520’s. In that writing he describe in detail how Aztecs lived as a civilization and in one instance he described a dish which describes what is pipian today, he stated “casserole of fowl made with red chile and with tomatoes, and ground squash seeds”. Wow, what a different recipe! My mom and husband would love this! Nice pairing with the nuts and beautiful salad, brings out some of flavours. Pumpkin seeds are great for digestion! Loved reading the history of the sauce too, very informative and the dish looks great! I have never had such a sauce…with a teaspoon of cayenne, I think I’d need a fire hydrant near by, wow. Oh my I’m drooling! This looks so fabulous. I love the idea of a nutty, earthy and spicy sauce. Yum! What a perfect recipe for fall. Everyone overlooks the seeds! I’m not familiar with pipian, but it looks and sounds tasty to me! I’ve never had Pipian but I love this photo, it’s mouthwatering..
LOVE good Mexican food, so I do feel lucky to live in Texas, where I can get both authentic Mexican treats and good Tex-Mex! Pipian is a lovely concoction, isn’t it! What a beautiful presentation of the food! Learned new sauce today. How do you learn all kinds of dish Raymund. I’m always impressed by your wide knowledge about food! Looks fantastic! I just found your blog though Samina Cooks on FB. Beautiful photos!!! I love how simple and gorgeous this is. I’ve never heard of pipian before – thank you so much for introducing me to a new dish! Looks so wonderfully colorful and flavoursome. Are you kidding? This looks sooooo delicious!! I love avocado pears on my food! !